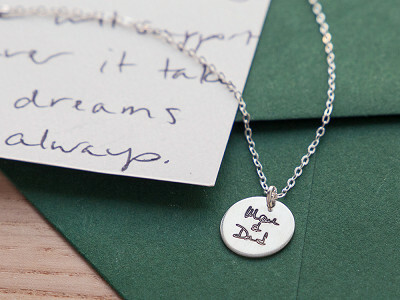 Custom laser-etched jewelry with a loved one’s handwriting is as personal as it gets. Each piece from Etched is Made in the USA from sterling silver. When Maker Teah Keogh moved away from home, she found a note from her Dad. Teah kept it hoping to one day memorialize it. When technology finally advanced to champion her idea, she had it laser cut into a necklace. 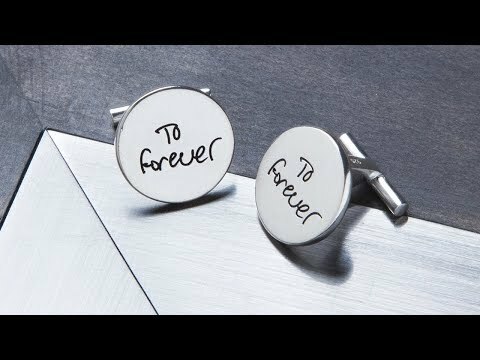 These sterling silver necklaces, keychains, and cufflinks come engraved with a message in familiar handwriting, making each piece feel extra special and entirely unique. 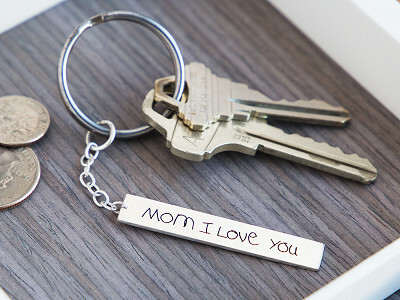 Engrave a reminder of home when you part for college, of your kids when you’re at work, or of a loved one you’ve lost. Etched is a timeless way to carry what you love, close. I'm Teah Keogh, owner and designer of Etched. 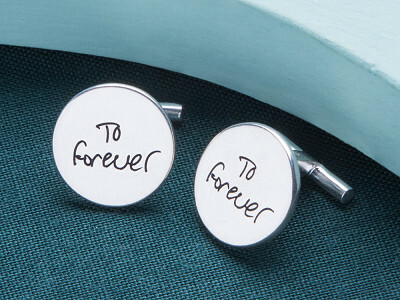 I'm thrilled to have these personalized jewelry pieces featured as today's Grommet. 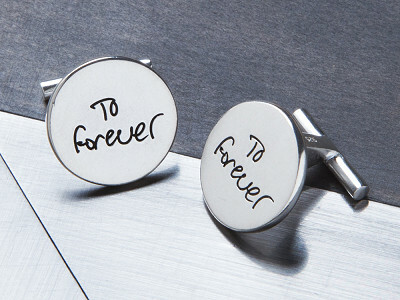 I'm a sentimental fool and wanted to create pieces of jewelry that allow you to keep your loved ones with you always! I hope you find them as meaningful as I do. @kelly I LOVE the idea of a charm bracelet! I will talk to my team at The Grommet about adding that option soon! Have a great day! 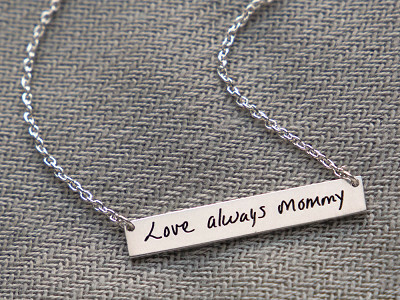 or, in the alternative, multiple pendants on a chain-- thinking that I'd like one made for each of my kids' little boy handwriting. Or could etching be done on both sides of a pendant? @kelly We currently do not have the double sided or double pendant option available, but it is something we can certainly do in the future. I will look into getting a single pendant option available on The Grommet so you can add it to the pendant necklace now available! @Teah Lovely idea but why are they so expensive and why are they all the same price? @Joan Hi Joan! The pieces are all the same price because they all weigh about the same. Each piece is made from 925 Sterling Silver and the process to obtain the handwriting and then clean it in our software program, size it accordingly, and then hand engrave it on the jewelry is quite painstaking. We take a lot of care to make each piece unique and want them to last a lifetime. I purchased a beautiful sterling silver necklace from Dressd months ago. The weight of the piece is perfect and the quality is excellent. My father passed away 11 years ago, but every time I look down at my necklace engraved with a handwritten message from my dad, I am reminded of just how much he loved me. Thanks, Teah! Absolutely beautiful. @Charlotte Thanks, Charlotte! I'm so glad you posted! I love to hear when people are happy with their Dressd. pieces! Oh I love this, and add me to the charm bracelet list or even an ID style bracelet list. This would be a great remembrance of my late father. Much better than the tattoo I was considering! @Jill Jill! That was what I was considering when I first found the card from my Dad. His handwriting is not all that beautiful though, so I engraved it on a necklace and made it beautiful! 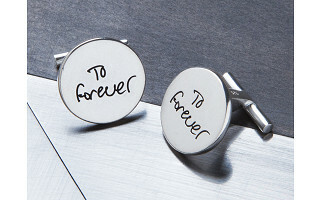 I ordered cufflinks for my husband with his parents' handwriting, 3 years after his father passed away, and he loves them. Thank you for coming up with a custom piece of jewelry that works for men as well as women! @Laura Thanks, Laura! Guys deserve cool pieces of jewelry too! So glad he likes them. Yes! I agree! These are beautiful and I would love the option to add additional pendants for multiple children/family members. I would be sold! This is a fabulous idea!! I just lost my Dad a year ago, and my mom a few years before that. I saved all of their letters and cards. I also have three children and would love a charm bracelet or 3-charm necklace option as well!